This morning I am in East Tennessee visiting kids and grandkids. Also, I am in the area to attend my Spring Board of Trustees meeting at my college scheduled later this week. Fortunately, I am in much better shape medically speaking compared to the past two weeks and would not have been able to make this trip if I had not gotten better. Feels good to feel good! While on campus this week, I hope to meet both of the students, Xavier and Casey, who will be traveling to Copey in May. I am very impressed with both of them and it would be certainly a highlight for me to make personal contact. I will update you next week on how this goes. On the other end of this great adventure are both Celeste and Noelia who according to Angela are very eager and excited about their pending travels to the USA and the Emory & Henry College campus. It is not only the students but the parents and the Copey community who are all excited and happy for these two young ladies. Jose. Once these guests arrive at the college, all of their expenses will be covered by the local community and the Rotary Club. “Friends” is taking care of the airfare expenses for all three travelers; Angela, Celeste, and Noelia. Just another sterling example of what teamwork and partnership efforts can accomplish. students official K-Kids…not just Pen Pals. If this can be done, it will represent a very unique and amazing achievement. Well, this is what we are known for…unique and amazing results. So keep up with the prayers and positive expectations. What is a K-Kid? Finally, I would like to share an amazing experience I had while traveling here. More than a few times, I have told others about my chance encounters with people who have some interest or connection with Costa Rica. While I am in the middle of such an experience, I am renewed and reminded how special “Friends of Copey” is. I fear most of you “Friends” miss this kind of experience because you do not just take a minute to tell someone, friend or stranger, about your support and involvement in this project. Next week, I want to introduce you to a special young student, Mikayla. Our short flight together was a very fun and informative experience sharing information about Copey, her life’s dreams, and her future. Plan to meet Mikayla next week. We are moving towards our Easter Sunday and in Costa Rica the country celebrates Holy Week or Semana Santa. During Holy Week, the Learning Center takes a week long break. seafood, complying with the Catholic practice of not eating meat on Fridays during Lent. Delicious dishes such as rice and shrimp, ceviche and fried fish are prepared. Various desserts such as empanadas, pudding and jelly are all made from chiverre, a big squash that looks like a watermelon and is in season during this time. There is also a very down side to the celebration of the Holy Week. Many Costa Ricans and tourists head to the various beaches and the celebrations often result in weekend accidents causing useless fatalities…especially among the young. We hope the Holy Week is a safe week for all. Again, thanks to several of you who sent “get well” notes. By my estimate, I am close to full recovery. your interest and willingness to stay connected with the Blog each week. Over the past two weeks, you have been introduced to both Casey and Xavier. You can see these two students are very special and have both academic and non-academic interests which will fit well into their volunteer time in Copey. I am looking forward to keeping everyone informed on how things are going once they arrive in Copey in May. Thank you for staying connected. But There Is Joy In The Morning…! Surprises come in all forms including good and bad. I was certainly not expecting to get put down by an upper respiratory viral infection this past weekend which has managed to keep me mostly horizontal until today. This morning things feel much better. Well, feeling 50% better is wonderful compared to how it has been. Yes, there is joy in the morning! Thank you for the notes and phone calls. I am certainly appreciative beyond words. So let’s get the focus back on the Learning Center and some of the updates that are important to note. I promised to introduce you to both Emory & Henry College Bonner Scholar students heading to Copey in May to perform volunteer services. You have met Casey and now I present to you Xavier Marshall. Xavier is a Sophomore from Fredericksburg, Virginia majoring in Spanish and pursuing a minor in Biology. Similar to Casey, Xavier is also very active and busy beyond his college studies. He is an Emergency Medical Service volunteer pursuing his medical interpreting license with long range goals including attending medical school. In addition, he provides campus tours in support of the Admissions Office and supports his education by working at a campus restaurant. Xavier sums up his interest in this volunteer opportunity in Copey with these words…”I can’t wait to come to Copey and meet all of the wonderful people. I know that this summer will be one that I will never forget.” From the point of view of the “Friends of Copey”, Xavier will be a very exciting part of the volunteer team taking his strong interest in medical services, Spanish, and biology to the Learning Center and the community of Copey. I will provide frequent updates on Xavier and Casey’s pending departure scheduled for May and their work while in Copey. I can predict with certainty, both students will make a major impact on both the community and the kids in Copey. And I also predict they will return from Costa Rica transformed from their experiences. I know! 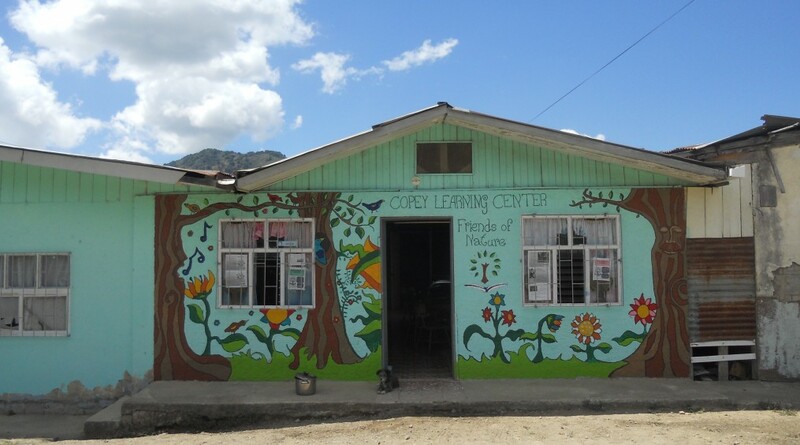 In other news, my very supportive Kiwanis Club recently approved “Friends of Copey” to move forward in its efforts to set up a Learning Center K-Kids Program that would be sponsored (financially supported) by our Club. This is “HUGE” and maybe…just maybe the first K-Kids Program of its kind. This is in its earliest stage of development and I will keep you posted on this. I am a 100% believer in Kiwanis and its commitment to children in our own community as well as nearly a continent away. Make no mistake about it, The Kiwanis Club of Tri-Cities Industry is a shinning example of what serving the “children of the world” can look like. If there are other Kiwanis Clubs out there listening, get in touch with me. There is plenty of room from more service in Costa Rica. We had a planned Skype session between Jefferson Elementary K-Kids and the Learning Center students yesterday that I had to cancel. We will reschedule. More great news is breaking as I write this and I will catch you up in my next Post. In the meantime, I still have some work to do to get back in shape to deal with most of this. Thanks for all of your support and well wishes. another day is calling they seem to think. Another day full of hardship, work, failure, disappointment, and dissatisfaction waiting. In short, it is a day lacking the joy of living. Some of us arise each morning with something different in mind. There is a sense of great expectations and we look eagerly for the day to begin. We firmly believe we have something important to do and we soon get about the business of getting it done. So we say to the world…”Hand me another brick”! As a kid, I worked summers as a laborer for my Uncle Ed. He was a highly skilled and respected brick mason. We specialized in constructing brick patios, brick walkways, retaining walls, and such. As the 10 hour workday would wind down, I would be totally exhausted. My youthful energy was spent and I was ready to go home and call it a day. Then, I would hear Uncle Ed, at age 67, say…Hand me another brick! He found joy each day while performing his craft. His day did not end when he got tired or when he did not feel well, or it was too hot or rainy. It only ended when his work plan for the day was complete. Everything he built was something he thought was important and the work provided him with a purpose to wake up and be excited about life’s possibilities. People depended on him. It is a blessing when you know you have a purpose and that what you do matters to others. “Friends of Copey” offers me the opportunity to wake up each morning feeling eager for the day to begin. For certain, my time each day with this project is a day of joy. I am excited to see a message from Copey and equally excited to share the information with each of you. I enjoy seeing the smiles of students who have a deep appreciation for learning…especially learning English. I look forward each day to the possibility that something wonderful and significant will happen. And it often does. Even today, something very wonderful happened but I will share it later. I have come to understand the drive and determination embodied in the words…”Hand me another brick!”. As “Friends of Copey”, we are busy building something important and there are those who depend on us. I encourage you to recognize the significant difference we are making by doing the things we do. It can be enough to cause you to wake up almost euphoric and excited about the new day. Do you feel like you do not really have a role or a reason for being a “Friend”? Do you ever have a wild idea you think would make a big or even a small difference in the day in the life of a kid in Copey? Have you ever thought about writing a personal and encouraging note to Angela or the kids at the Learning Center? There are so many ways to be a “Friend” and make a huge difference. You just have to say…”Hand me another brick”! Next week, I will provide an update on our Executive Director fundraising campaign, an update on our E&H College students traveling to Copey, and some exciting news that could be groundbreaking. Thanks to all for all you do!